"Leadership appears to be the art of getting others to want to do something you are convinced should be done." This is an interesting definition of leadership by Vance Packard, an American journalist, social critic and author. As a project manager, have you ever felt that even though you are doing everything "right," people are still not paying attention to your project? Or that even though you manage an effort, others appear to have a stronger influence over what happens? Or wondered what combination of skills makes a project manager a more effective leader? As project managers, we are trained to control the three key project influences of scope, schedule, and budget and to understand the nuances of team dynamics. Some would say that we are fanatic about driving productivity and meeting schedule commitments. Other project managers embody all that, but they have something more going for them. They have an uncanny ability to spot red flags, they are zealous communicators, and they are well respected by peers and business leads. They demonstrate an ability to balance what needs to be done, as driven from the plan, with what should be done to meet the business need, even if it is counterintuitive to the project roadmap. These are the project managers who instill confidence, who are invited to participate in business discussions, and who are asked to weigh in at the project inception stage. What separates these project managers is that they not only manage, they lead. Demonstrates a passion for learning: Learning means staying relevant. Learning means having new ideas that may challenge the status quo. Being curious means you are asking questions, connecting the dots, gaining insight, getting beyond the superficial, and getting a knowledge base that positions you as a go-to person. Each project brings learning, and those mindful of this know how to leverage their successes and failures in the next project. The benefits of your experience become tangible assets in every project. Demonstrates a personal commitment to success: Commitment fuels accountability which translates into proactive behaviors. For a project manager this means a willingness to advocate at all levels, whether it is helping the team get unstuck, finding out what motivates an individual and providing it, or empowering "poor" stakeholders whose contributions are vital but who would otherwise not have a voice in decisions. It is an expectation of accountability in others and the willingness to address a lack of commitment, but with compassion first. In other words you operate in a manner that suggests there is always a way to solve an issue, that you are willing to work with anyone to help resolve it, but you are always calibrating with the end goal in mind. Takes calculated risks: Risks are uncertain events that could have a positive or negative effect on your career and in your projects. As project managers, we often focus on mitigating risk but tend to forget that there is the opportunity aspect of risk. Taking a calculated risk means you've weighed the costs of failure against the benefits of success and have chosen to move forward. Have you ever volunteered to work in another area of the business, or on a project outside your comfort zone because you wanted to stretch yourself? You face a hit to your reputation or maybe a longer work day, but the reward is that (combined with your passion to learn and commitment to success) you gain more experience and become even more valuable to the business. A calculated risk in a project context is to try a new technology or to mentor a less talented team member knowing that it could slow things down or require additional costs, but the end result, if successful, will benefit both the current project and future projects knowing that you've created more assets for the business. Bottom line, you are willing to go outside your comfort zone for a better result. Delegates effectively: Delegating effectively creates an atmosphere of enablement. You are able to focus on higher-level project management activities and your team is empowered to make significant contributions. To delegate effectively you must be able to assign work and create an obligation to perform. How is that done? You are clear about overall purpose of the task and the desired outcome and ask (versus dictate) an estimate to complete. Based on a mutual agreement on deadlines, you identify when you want progress updates. Most importantly, based on the experience and comfort level of the team member, you agree on what level of autonomy is required. In developing high-performing teams, the goal for the project manager is to become less directive and more facilitative — giving the team more and more capability to self-manage. 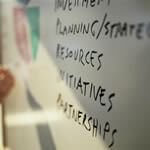 Initiate: Understand and communicate your project's alignment to the business strategy. Leadership goal: Create a high-performing project team. We hope these were helpful examples of how to display more project management leadership behaviors. Above and beyond getting the project done, project leaders are mindful of sharing a vision, empowering others, modeling the way, being integrative, and balancing what's required by a schedule with what's practical in view of the larger goal. Bonnie Cooper, PMP, trainer, and consultant with Corporate Education Group, is a 25-year information technology professional and currently the Technology Product Owner for the Massachusetts Medical Society's Corporate Membership Division. In her current role, Ms. Cooper is responsible for coordinating the efforts of agile product teams, defining roadmaps, refining product backlogs, and leading the program to re-engineer the membership services platform. Ms. Cooper is a project management educator and a published writer of her experiences in facilitating IT strategy and governance.